Kevin Martin pushed back the lid on the giant blue dumpster and stepped aside, letting a handful of students peer at a small mound of lemon rinds, lettuce leaves, broken eggshells, and brown paper bags. “All of this is generated from the dining hall. It doesn’t come from anywhere else on campus,” said Martin, The Williston Northampton School’s director of dining services. “Wow! That’s great!” exclaimed one of the students. 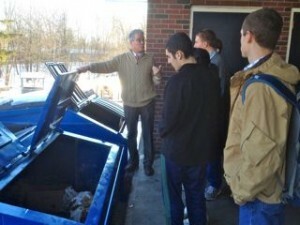 The students, members of the school’s Sustainable Life Club, were touring the school’s new compost system, which included the dumpster—a large example of the reduce, reuse, recycle motto they try to embody. Although school officials have considered composting the waste from the dining hall for several years, it took a final push from these students to make the effort a reality. The new compost bin was installed in early January; on a cold Monday, club members admired the squishy results of their hard work. The idea of collecting compost on a larger scale first occurred to Nick Pattison ’14 while he was working with the school’s community garden last year. The garden has two compost bins, which garden club members fill with prep scraps from the dining hall. Earlier this year, Pattison helped form the Sustainable Life Club (also known as the Green Team) and also began a small composting project to bring a small bin from 194 Main, the dorm he proctors, to the garden. After meeting with Martin and talking over priorities with club members, Pattison also wrote an editorial in The Willistonian student newspaper, advocating a larger-scale composting route. Williston staff had looked into large scale composting before, including a trip to Springfield College to examine the operation there, but ran up against logistical and budgetary roadblocks. At the time, hauling the compost away was too expensive. Adding another dumpster to the multiple bins in the dining hall parking lot would have required an extension to the loading dock and was simply not practical, said Jeff Tannatt, director of the physical plant. Then Williston switched to single-stream recycling. What had been separate dumpsters for bottles, cans, paper and cardboard became a single bin, Tannatt said. With the Sustainable Life Club behind the project, Tannatt and Martin again broached the subject to see if they could make dining hall compost a reality. Over break, Tannatt contracted through Allied/Republic Waste Services for a compost dumpster. He estimates that the dining hall will generate around eight cubic yards of compost per week—food that previously went down the garbage disposal, plus napkins, cardboard, and wooden crates. 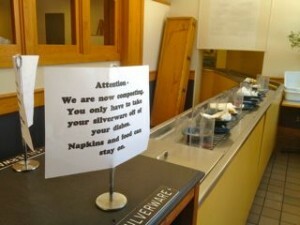 Cardboard and napkins are encouraged as the paper products soak up liquid in the bin. The compost dumpster adds $800 per month to the school’s trash expense, but Tannatt said he expects to see less in the trash and recycling bins. He also expects to see a savings on the water side, now that the dining hall’s garbage disposal will not be needed. When it’s running, the disposal uses around seven gallons of water per minute (420 gallons per meal and 1,260 gallons a day). The grease that builds up in the disposal throughout the year will also almost entirely disappear. 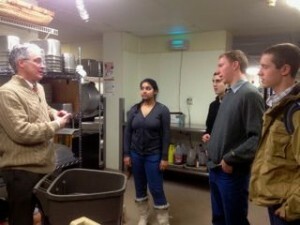 There has also been a compost learning curve on the dining hall staff side, said Martin. To help with the process, he placed compost buckets around the kitchen and hung posters indicating what could be composted. The big blue bin itself has been marked with notices about the compost; other signs let diners know to leave their scraps and napkins on their plates. To cut back on waste further, Martin has started looking into dining hall changes such as buying oyster crackers in bulk, rather than in individual packages. Martin said that there has been only one issue he’s noticed since the compost bin was installed in early January. Talk about a team making things happen: Kevin, Jeff and most importantly Nick and the Green Team! Congratulations to you all. I will report your good works to the Board of Trustees this weekend and encourage them all to read the Blog. Happy composting!